As you may be aware, we have a modern, responsive and mobile friendly version of Bundledocs ('Bundledocs All Devices'). With most of our users having already made the switch, we are excited to announce that moving forward we will be developing all future releases on this version. From July 31st 2017, we will be moving all our customers over to the latest version of Bundledocs. You don't need to make any changes on your side as everyone will be automatically moved on this date. 1. Access Bundledocs via login.bundledocs.com. 3. Login to Bundledocs using your username and password. That's it! You have successfully made the switch to the latest version of Bundledocs. Now Bundledocs will have the same look and feel regardless of what device you use, whether this is a desktop, laptop, tablet or smartphone. Any questions? Make sure to get in touch with our dedicated support team who are happy to any queries or questions you may have. 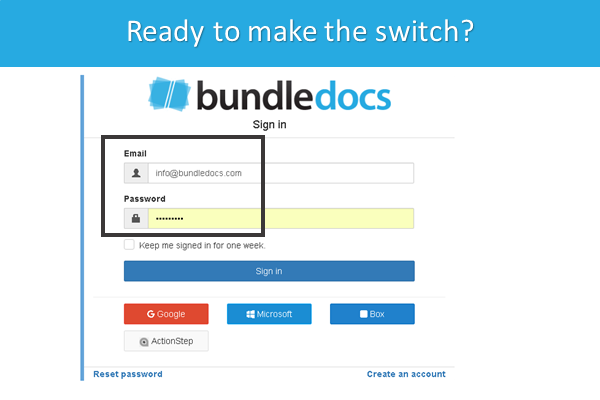 Recently our online support team had an inquiry from a new user asking how they can put a bundle in order with Bundledocs. If you are new to Bundledocs and were interested to know how to move single and/or multiple files in Bundledocs, then this is the post for you. Ordering and re-ordering files in Bundledocs is simple. To move a single document you just have to click on the file you want to move. Select the file type icon i.e. the PDF icon, word icon etc. to move any file. Once selected you can simply drag and drop the document into a new section and/or position. Still unsure? 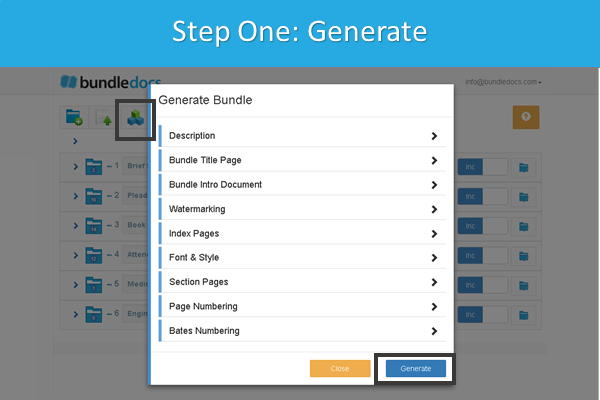 Check out our '5 Steps to Create a Bundle' video to see it in action! 1. Choose your files using the select icons - these are located to the right of any uploaded document. Once selected the blue icon will turn red. 2. Select as many files as you need. Each selected document will be numbered. 3. Then when you are ready to move the files, you just need to use the same process used when moving one file. Select the file type icon, in the example above we will select the PDF icon. 4. Once selected, simply drag and drop the documents into place. That's it! Moving and arranging files in Bundledocs really is simple. Don't believe us? Why not register for a trial and give it a go for yourself. It's completely free! Any Questions? Be sure to get in touch with our dedicated support team who are happy to assist. If you are regular reader of our blog, you may be aware that we recently announced the introduction of our new Font and Styles feature. This is a great new release as it allows you to customize your bundle even further. This week we highlighted how to apply font and styles to your bundle. That's not all. Our latest release also allows you to set a default font and styles for your index pages, section and page numbering. This will ensure that every bundle created in Bundledocs will utilize these settings. How can you set default font and styles for your bundle? 1. Select your email in the top right corner. 2. From the drop-down select 'Account Settings'. 3. Within the 'Font & Style' section you have the ability to customize how you would like your bundle to appear. 4. Press 'Update' to save any changes made. Interested to learn more? Make sure to download a copy of our manual to find out everything there is to know about Bundledocs and get up to speed fast.